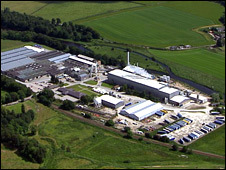 "Meaningful talks" have been held with a consortium of companies on the possible reindustrialisation of the Inverurie Paper Mill site. More than 300 workers lost their jobs following the decision to close it. A consortium is looking at establishing a green energy plant, but any new jobs are thought to be several years away. A task force is continuing efforts to find work for the redundant workers. First Minister Alex Salmond, the Gordon MSP, said the talks were "encouraging". He explained: "Although full details have not yet been released I am very pleased to hear that there is such positive interest in what is a superbly located site. "The idea of a green energy plant is very exciting and at a time when the issue of climate change is very much to the fore, it is particularly important that any new development has this at its heart. "A huge amount is being done to ensure this key site, with its excellent transport links, is redeveloped to its full potential. I am sure that local people will be pleased to know that plans are moving forward." Mr Salmond added: "In the meantime extensive efforts are being made through the jobs taskforce to support the paper mill workforce in securing training and employment which has already achieved substantial success." Efforts to sell International Paper's mill as a going concern failed.